Last night I went ahead and did something I've been meaning to do for ages...I updated and changed my blog name! What Danielle Loves is no more. There are permanent redirects set up though, so hopefully there are no hiccups with links etc. Not long after I started blogging again (I had a blog about 2/3 years ago) the name I had chosen, 'What Danielle Loves', stopped feeling right. There are so many blogs out there with the same, or similar, format that I felt like I was just getting lost amongst them all. It didn't feel original at all, it stopped feeling like it suited me or what I want from this blog. I wanted to be different, to have a name that I felt connected to and so Simply Courageous came to be. It took me so long to actually get round to changing the name and url of my blog, mainly because I was absolutely terrified of doing something wrong! This blog started as a hobby, something to do because I like to write, but I have very quickly come to love it. I didn't want to do something wrong that might mess it up, or delete it altogether and so, I stalled. Then it hit me one night, that if I don't catch a grip on myself, man up and just start the process then I probably never will! So last night I went on to GoDaddy, purchased my domain name and then went on the hunt for a tutorial on how to set it up. This was how I found Elaine. Her blog is amazing! It's full of tutorials for every possible thing to do with blogs and Web design! Her tutorials for changing a blog url and moving from a sub-domain to a custom domain are absolutely genius. They are so clearly laid out, there are screenshots of what you need to be doing, even the questions and answers in the comments were helpful! Honestly, her tutorials were so easy to follow that I felt silly for having waited so long to make a move. Thank you so much, Elaine, for all your amazing help! I really, really like this name. It feels right, if feels like me. It feels like it was just waiting for me to find it! It makes me have faith in myself, makes me feel strong, and like I have the ability to do whatever I put my heart in to. Hopefully, it says the same kind of things to you. I want this blog to be helpful, to be useful. I want to share my life with you, the ups and downs, highs and lows. I want to share my travels with you, whether they are small adventures or massive ones, it doesn't matter! I want to share my faith with you, not in a "shove it down your throat, throw it in your face" kinda way, but just in a sharing way. We all believe different things, and that's okay. We are all different, unique, each and every one of us are one-of-a-kind. I respect other people's beliefs, and their right to have them, and I want to use this space to share mine. 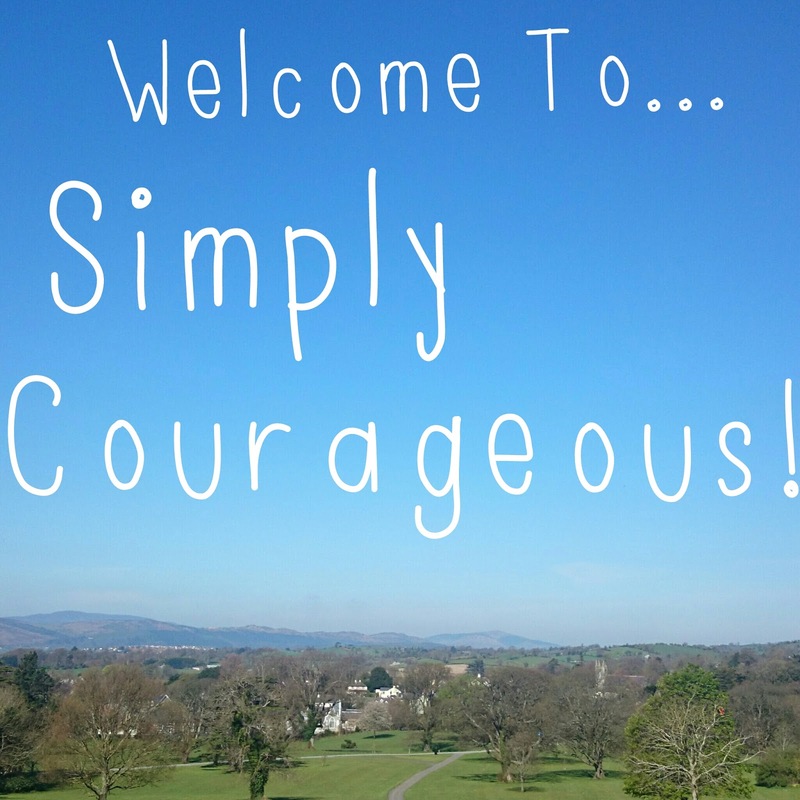 Here's to being Simply Courageous! Please let me know what you think in the comments! August Round-Up & September Goals! David's Birthday - The Highlights! July Round-Up & August Goals!